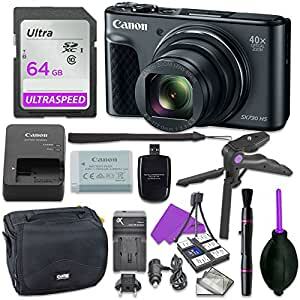 A versatile and compact point-and-shoot, the black PowerShot SX730 HS from Canon combines a wide-reaching zoom with apt multimedia recording capabilities. Employing a 20.3MP 1/2.3″ High-Sensitivity CMOS sensor and DIGIC 6 image processor, smooth image quality is afforded along with enhanced low-light sensitivity and minimal noise when working with sensitivities up to ISO 3200. The sensor and processor also enable shooting continuously at a rate of 5.9 fps as well as recording Full HD 1080p/60 video. Benefitting the imaging capabilities is a 40x zoom lens, which covers a 24-960mm equivalent focal length range, to suit photographing in a wide variety of situations. Intelligent IS complements this reach by minimizing the appearance of camera shake for sharper handheld shooting. Sleek and pocketable, the SX730 HS is also characterized by its 3.0″ 922k-dot tilting LCD monitor, which is perfect for shooting from low angles or taking well-composed selfies, and built-in Wi-Fi with NFC and Bluetooth connectivity allow you to wirelessly share imagery and remotely control the camera from a paired smartphone or tablet.